Anyone who has read Peter May's magnificent "Lewis Trilogy" will have extremely high expectations of his latest novel, "Entry Island". We certainly did. But however high your expectations, we suspect you will find them easily surpassed by what lies between the covers of this truly remarkable novel. It's not often you come to the end of a book worried that your stock of superlatives might simply not be up to the job of describing it in a way that does justice to the author's achievement. But that's how we felt when the complex set of interwoven strands that make up this book finally meshed in its closing pages into a pattern that is both beautiful and extremely satisfying. So, Canada then? Yes, one of the two main strands of the book is set in the province of Quebec, and in particular on Entry Island, an outlier of the Magdalen Islands or Îles de la Madeleine, a remote archipelago that can be found in the Gulf of Saint Lawrence. The wealthiest of its residents, who has made a fortune from lobsters, is found murdered, and everything points to his wife as the murderer. Sime Mackenzie is one of a group of detectives from Montreal sent to investigate the murder. Sime has the sort of dysfunctional personal life that is the hallmark of detectives produced by Scottish authors, but we're not sure we've previously come across one almost completely unable to sleep, or who has to investigate a murder as part of a team that also includes his estranged wife. Then Sime meets the widow of the murdered man and chief suspect, Kirsty Cowell, and is convinced he knows her. Cue the opening of a much deeper mystery that extends across both space and time. The little sleep Sime is able to get becomes filled with vivid dreams inspired by an ancestor, also called Sime, who was born and brought up in a tiny community on the west coast of the Isle of Lewis in the first half of the 1800s, who knew another Kirsty. The way these two very contrasting strands of the story are managed is superb, and while we follow Sime and his colleagues in their hunt for a killer, we also follow his ancestor, mainly though Sime's memories of extracts of diaries read to him by his grandmother. A murder hunt on Entry Island suddenly becomes our entry into the world of crofting, of the potato famine and of the clearances in the Western Isles. We also find between the covers, almost incidentally, one of the very best accounts we've read of the experience, shared by many Scots, of emigration to the new world. You might be wondering from our description whether this is a crime novel, a historical novel or a romance. Who cares about categories? 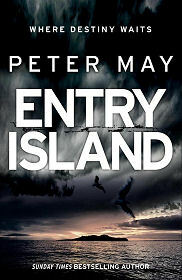 "Entry Island" is simply another outstanding novel by Peter May. Though on second thoughts, nothing is ever simple with Peter May, and this is not "another" novel by him: we think it's easily his best yet.